of them — nor was DC Comics, his publisher, the first to try it. A dozen years earlier, Fox Feature Syndicate had done exactly that, when it revived one of its earliest stars, The Green Mask. Prize Comics' Black Owl had earlier been replaced by a new Black Owl, but there, the new one simply continued the series where the old one had left it. 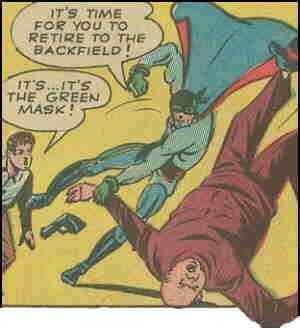 This Green Mask acknowledged the existence of an earlier superhero of that name — but that wasn't the Green Mask readers knew, either. In this one's scenario, the original Green Mask was Walter Green, mentioned but not seen in the first story (the credits for which aren't known). The current Green Mask was Walter's son, Johnny, who was in his middle teens. Johnny Green did the old Captain Marvel routine, changing from a powerless kid to a grown-up hero (non-powered but good in a fight). In his case, it wasn't a magic word that brought on the transformation, but his emotional state. Anticipating The Hulk, he'd change from his ordinary self when he got angry. Therefore, The Green Mask, when functioning as such, was always in a rage, beating up bad guys like he couldn't help himself — because he couldn't. When he'd done enough beating up for his anger to subside, he'd change back. This went on almost as long as the original Green Mask had lasted, but he didn't have as many adventures because he wasn't published as frequently. There were eight issues. The last (vol. 2 #6, whole #17) was dated Oct-Nov 1946. Neither Green Mask has been seen since except at AC Comics (Femforce), where defunct heroes from defunct companies often turn up.